The Ballarat Veterinary Practice Equine Clinic is proud to establish a new service in equine podiatry. Foot related issues are a large part of our work at BVP and we pride ourselves on diagnosing these issues using our experience and modern technologies such as digital radiography, ultrasonography, scintigraphy and standing magnetic resonance imaging (MRI). Now with the addition of skilled farriers we have combined top class science with top class farriery to develop Equine Podiatry @ BVP. 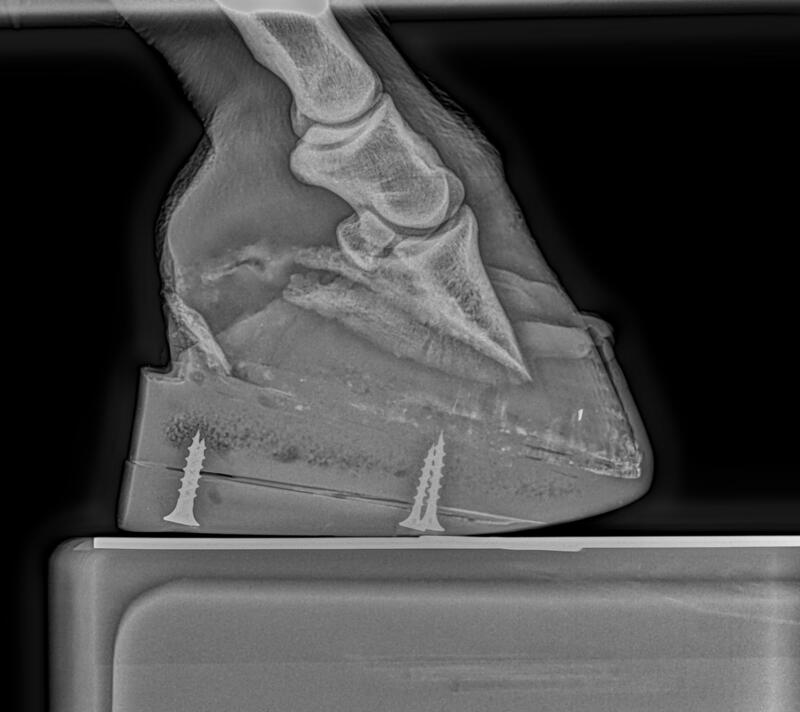 Our equine specific veterinarians and farriers have the ability to diagnose, plan and manage equine podiatry cases from foot abscesses to the most severe nail penetrations 24 hours a day and 7 days a week. We aim to provide a podiatry service from the time your foal is born to the end of your horse's geriatric years. 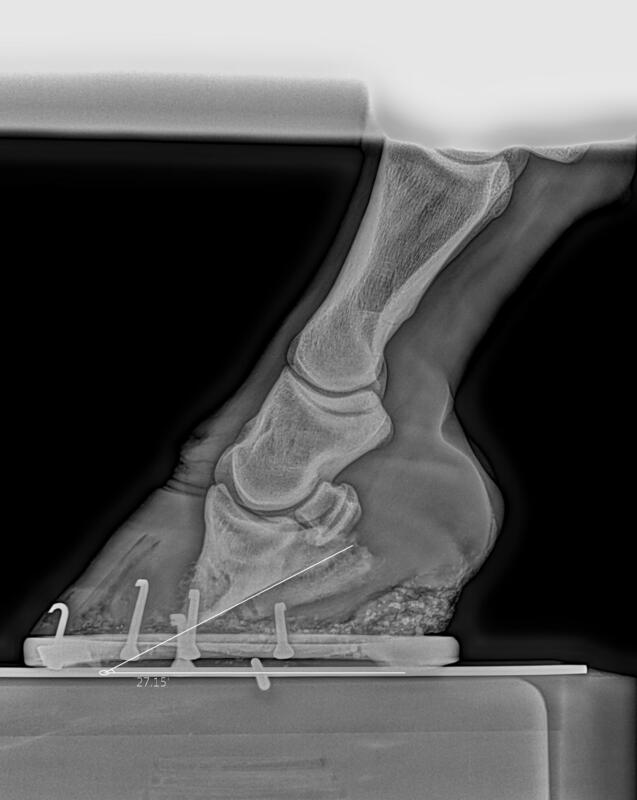 Please use the links below to fast track you to common equine podiatry conditions. If you have any questions please contact us on 03 5334 6756. Podiatry in foals is very important. A foal's physical state changes daily in the early part of its life and so particular care is needed to monitor their feet and legs. Podiatry is used to manage clubbed feet and contracted tendons but it is also used to correct angular limb deformities and tendon laxity. 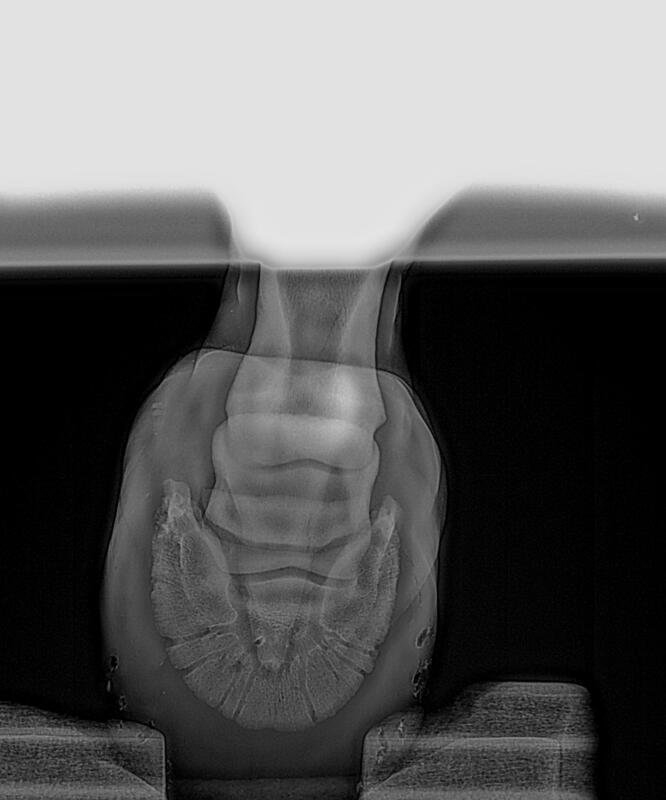 BVP can assess your foal at your property both physically and radiographically and make a plan so that your foal develops in the most suitable way it can. Navicular syndrome is an umbrella term used for pain originating from the region that includes the navicular bone and its support structures. 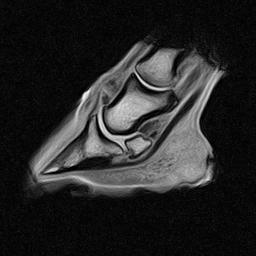 Therefore, diagnosing navicular disease can be complicated. Commonly, pain with testers over the frog, a positive block of the palmar digital nerve and radiographic changes in the navicular bone are enough for a positive diagnosis for navicular disease. Using only one of these diagnostic tools can result in a false diagnosis. 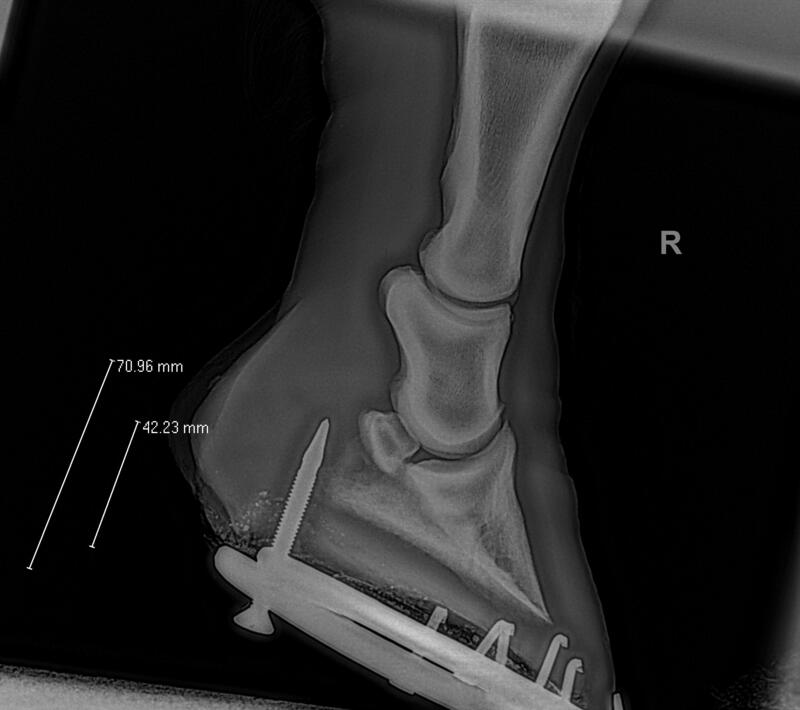 There are many horses going around with significant lesions in the navicular bone, on radiographs, that haven't had a lame day in their lives. There are also horses with no radiographic lesions that are chronically lame from pain originating from the navicular area. Treating Navicular Syndrome can be as frustrating as diagnosing it. Our approach is to assess your horse and understand the mechanical requirements of its feet. Then a plan is made with you and our/your farrier with a specific goal in place. Regular communication is really important in achieving the best outcome. Clubbed feet are one of the most common conditions seen in equine podiatry. The exact trigger mechanism for causing a clubbed foot is not proven yet however it is generally accepted that the deep digital flexor muscle fibres have abnormally high tone therefore increasing the pull on the deep digital flexor tendon on the pedal bone within the foot. This results in chronic pedal bone rotation as the foot develops and so a short, steep contracted hoof capsule develops. The first step in managing clubbed feet is to correctly grade the severity of the club. Then applying knowledge of the mechanics and forces at play and skilled farriery a management plan can be made to treat the club in young horses or manage the condition in older horses. Many horses appreciate time in the paddock without their shoes on. However, just pulling the shoes off and tipping the horse out can be very detrimental to their feet. It is important to get the feet assessed and any issues addressed during the spell. This ideally results in a specific trim to suit the individual horse and regular monitoring in the paddock however, high performance horses often require remedial trimming/shoeing during their spell. We can assess your horse's feet and combined with a detailed farrier history set up a plan so that your horse benefits all round from a spell and they return to work with the strongest and healthiest feet possible. Long toe/low heel is a common presentation especially in thoroughbred racehorses. This can lead to conditions such as quarter cracks, crushed heels, traumatic laminitis and soft tissue injuries such as deep digital flexor tendon tears. These conditions are the result of chronic imbalance and trauma to the foot. One of the first signs of this type of conformation is the reduction in the palmar cortex angle of the pedal bone that sits within the hoof capsule. While the palmar angle of the pedal bone is influenced by rasping there are other factors that cause a decrease in the angle including heel tubule damage and ineffective heel support. The key to treating horses that have low or negative palmar cortex angles is to firstly be able to accurately measure the palmar cortex angle then relate the angle to the structures of the foot so that a remedial trimming/shoeing plan can be made. There are a number of principles in the remedial program that can be followed to maximise the outcome. Prevention is the best cure. Avoiding excessive moisture, over zealous trimming and encourage exercise and maintenance of hoof mass are important factors in healthy feet. If you have a horse with a chronic long toe/low heel conformation or a horse with heel pain there may be an underlying cause within the hoof capsule that can be diagnosed and managed. If you have any questions please contact our equine hospital on 03 5334 6756. Performance horses include all breeds that are used for regular competition ranging from pony club, eventing/showing circuits to endurance, dressage, showing, cutting, racing etc. All of these horses place different loads on their feet and so required special attention. There is no doubt that most horses can be competed either barefoot or shod and have no foot related issues, however there are a significant number of horses that develop foot related issues before any other issue arises. Thorough assessment and management of these issues in the early stages often results in a positive outcome. Laminitis is a very painful and sometimes fatal disease affecting a horse's feet. It is defined as inflammation of the pedal laminae which provides support between the hoof wall and the pedal bone. The image of a foundered pony standing in a "saw-horse" position is etched in every horse owner's mind. However, this is only one form of laminitis. Others include traumatic, endotoxic, metabolic/hormone induced and supporting limb laminitis (SLL). There can also be combinations of these acting at the same time in any breed of horse. At BVP we start by diagnosing the cause of the laminitis then make a plan with you and our/your farrier to relieve the symptoms with clear goals for future management. Endocrine (hormone) imbalances observed in diseases such as Cushing's Disease, Equine Metabolic Syndrome (EMS) and Insulin Resistance increase the susceptibility of your horse to laminitis. These diseases are easily diagnosed and can often be managed using specific protocols and medications. Once this is achieved the prognosis for managing the laminitis is considerably increased. At BVP we aim to have your horse comfortable in bare feet if shoes are not required. Our goal is to manage all horses through their intended discipline and culminate in a barefoot retirement. If your horse can undertake its discipline in a safe and sound manor in bare feet then we will do everything to support this process. Anyone can pull the shoes off a horse but not everyone can remove the shoes then make a short, medium or long term plan to stay barefoot. At BVP we see this as the first step in a program of total horse health to create strong functional hooves. Barefoot trimming/management can be maintained by you if you please however many people want their horses trimmed by a professional. If you are considering trimming your horses feet then you need to understand external conditions of the feet such as cracks, thrush and collapsed heels but also understand invisible conditions such as navicular syndrome, side bone, degenerative joint disease and laminitis. It is our recommendation that barefoot horses live in a paddock rather than be confined to a stall. The twilight years are an important time for our horses. They have done the hard yards for us in the past so now it is time to repay them with a good long spell in the paddock. While they are enjoying this time there feet still need constant attention. During their working years most horses will have been shod with various types of shoes. The aim now is for your horse to be comfortable without shoes. The transition from full time shoeing to barefoot can require a lot of attention and BVP can assist you in this process. Looking after the geriatric horse is complicated by endocrine diseases such as Equine Metabolic Syndrome, Cushing's Disease and Insulin Resistance. All of these make a horse much more susceptible to laminitis. These diseases are easily diagnosed and often manageable with specific medications. It is important to monitor your geriatric horses's feet because external changes may give you an early warning sign of changes in health.